Y'all I miss football. The sporty side of my blog totally suffers when there's no football. Someone the other day left me a comment saying they didn't know I was into sports. ERR MERR GERRDD. I've failed. I've totally failed. If you spend just one hour with me, I assure you that I'll find a way to awkwardly bring up the wide world-o-sports. I just did the research, I haven't posted about sports since May 13th. That depresses me. Don't think I'm not sitting here thinking about it though. I consistently open up a blank Fan Friday blog post and sit there, staring. WHERE IS FOOTBALL? TOO MANY GOOD HITTERS Y'ALL! Not enough batting spots! #RangersProblems! Praise the LAWWWWWD, I just remembered THE OLYMPICS! DUH, *FACEPALM*. Let's talk about the Olympics! Here's the little bit of background info that I know about the olympics, just from listening to ESPN Radio over the past year. 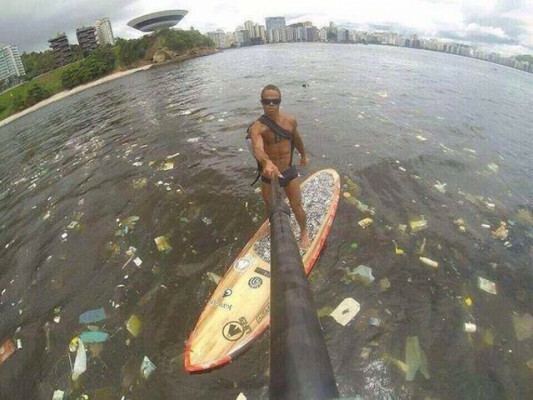 When Rio got the bid for the Olympics, they were in an incredible economic state. While the rest of the world was still trying to bounce back from the recession, Rio's economy was recovered and booming. As of June though, with speculation of government corruption, Rio has declared a financial emergency and has asked for help financing the Olympics. Upon receiving the bid, they promised to spend the amount of money it would take to clean up their water. What's wrong with the water, that athletes will be physically swimming, rowing, sailing and competing in? 3. Floating plastic bags, logs and submerged furniture (I kid you not, couches and refrigerators) - all of which will destroy a boat. WHY ARE NO MALE GOLFERS GOING TO RIO? The vast majority of golfers are saying the Zika Virus is holding them back. This would have been the very first time that golf would be an olympic sport in 112 years, and golf fans all over the world were hyped up for the occasion. That was until every single top golfer (seriously the top 4 in the world) backed out. Rory McIlroy, Jason Day, Jordan Spieth, Dustin Johnson, Adam Scott ... and many more. Rory even went so far as to say that he probably won't even watch television coverage of golf at this summer's Olympic Games, preferring "track and field, swimming, diving, the stuff that matters". So, at the very least, there is some major controversy surrounding this particular round of Olympics. But hey, look in the bright side, at least we have gymnastics! 1. What sport are you most excited to watch next month??? 2. If you were a pro athlete, would you go and risk the waters and/or the Zika Virus to live out your dream of being a gold medalist?